Billy Deamer, Emmius, Carpenter, Joe Austin, Fred Shepherd. Newberry, Stan Newberry, Day, Palmer, Bentley. Joe Shepherd submitted an article to the Stevenage Comet based on this photograph, which was subsequently published on Feb 27th 1980. Joe suggests that this is actually the first club to be called Stevenage Athletic and that the photograph was taken on Barclays Paddock, which was opposite the Marquis of Granby on Baldock Road. 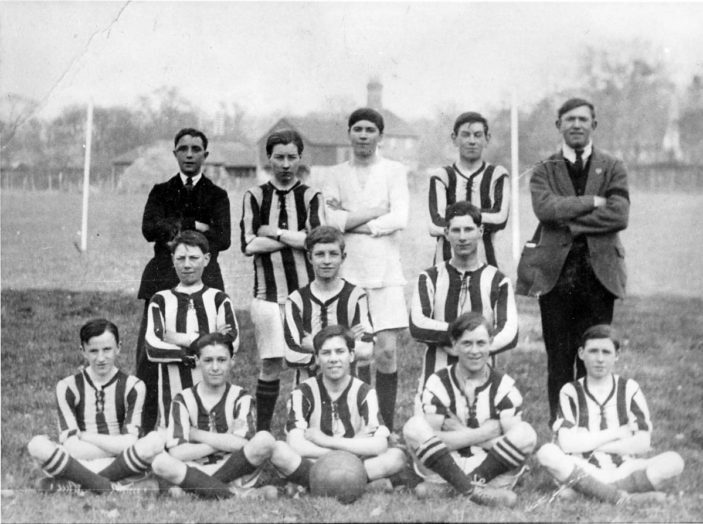 Joe cites the team as being (Back row – left to right): William Deamer, Cyril Hammond, Sid Carpenter, Will Austin and Fred Shepherd. (Middle row L-R) Fred Carpenter, Charles Turner, Ted Moules. (Front row L-R) Phil Newberry, Stan Newberry, Charlie Day, Cliff Palmer and Cecil Bentley. He goes on to say that the photograph was taken c.1921 but my research indicates that the first club to be called Stevenage Athletic didn’t actually commence playing until late 1922. Gloria, I am one of the editors of this site & have done research on the family. I will email you with some information. Are any of the Newberry family still living in Stevenage? I am looking for the history behind the house I am living now 2011, in which one of the Newberry´s family lived between abt. 1891-1921. Please add a comment to this page if you have any more information about this family.